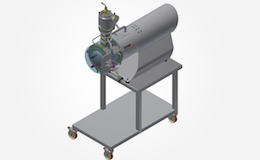 High-End Vacuum Drying & A Big Step Forward for Freeze Drying of Bulk Solids. AVA recently has developed and constructed a high-end lab-scale vacuum dryer for a leading lab for flame retardants. The machine can be well installed on a lab table, its size will fit in any chemical laboratory. However, its performance will make it a brilliant tool: This system is designed for proceeding dust explosive materials under inert atmosphere, the process temperature can vary between 5 and 300 °C. 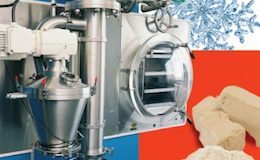 Freeze drying (lyophilisation) has been used industrially for decades to preserve foodstuffs and organic materials. However, traditional tray-type freeze dryers have proven to be labour-intensive. Due to the agitated freeze drying process, different product characteristics can be improved without the need of post-processing steps.